Once you realize you have found your perfect mate, the rest of your lives together feels like it cannot start soon enough. Proposing marriage is a big, exciting step in anyone’s life, and is one of the most memorable moments anyone will ever experience. A powerful display of true love, a proposal, is a pivotal moment in any relationship. As you plan your first step toward forever, think about what you will say, when you will do it, and exactly where it will happen. The central focus of your proposal planning should be your future spouse and doing everything you can to make it a magical moment in their life. There is a long list of romantic spots you can pop the question, and you should consider your partner’s personality before you choose. Nature lovers might find that a garden or park is their dream proposal spot, while an art aficionado might think that an iconic sculpture is one of the most romantic places to propose. Whatever you choose, make sure your location is special and meaningful. Here is a quick list of the best places to propose in Northern Virginia, to help you begin planning your big moment. With its romantic little streets and charming buildings, Old Town Alexandria has countless special corners where you can pop the question. 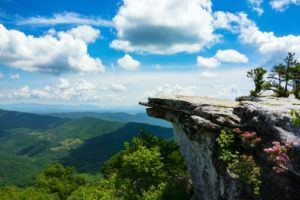 One of the most beautiful places in Virginia, McAfee Knob tops many proposal location lists for good reason. With an incredible panoramic view of the Catawba Valley, it is a jaw-dropping overhang. LOVEwork sculptures dot the Virginia landscape, using creative materials to spell out the word “love.” Any of the sculpture spots would be a sweet place to get down on one knee, and would make for fun post-proposal photos as well. The roar of the ocean and the secluded sands make this one of our favorite beautiful places in Virginia to propose. Once the location is set, all you need is the perfect ring. An engagement ring is a symbol of commitment and love that your partner will treasure forever, so take your time to choose something truly special. Paired with their wedding band, it will be a piece of jewelry that represents your love story. At Dominion Jewelers, our team knows how important this moment is for you, and we are committed to helping you find the perfect ring for your true love. Contact us to plan your visit, and we will support you in choosing the ring that will make your proposal one of the most memorable moments in yours and your partner’s life. ← The Best Places to Propose in Washington D.C.